Police Commissioner, Leslie James on Monday warned members of the Force against locking up persons because their family members complain they were “behaving bad” as they risk being injured by other detainees while in custody. “No one is to come to the station for you to take a relative into custody because they behaving bad. Behaving bad is not an offence,” he said. “There are persons who are there for serious crimes. What can be the possibility? 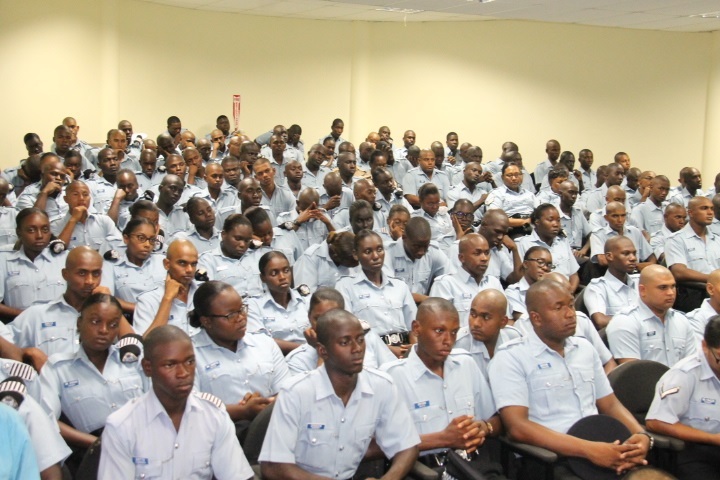 What can be the outcome?” he told the lawmen and women at the opening of a course on station management and a traffic seminar for constables. James’ comment came less than one week after a woman filed a lawsuit claiming GYD$50 million compensation for the death of her brother while he had been in police custody due to a report that he had been drunk and had been verbally abusing his mother. The Police Commissioner, meanwhile, told the law enforcement agents that “if you’re timid, you’re in the wrong job”. “You cannot be a timid soul and doing police work. It just can’t happen,” he remarked. He warned station managers that the Force’s administration would be “taking serious actions against you” for failing to comply with Standard Operating Procedures and Standing Orders. He also highlighted the implications of records in the station diary or the occurrence, saying that such documentary evidence could “have far-reaching implications” such as far as the Trinidad-based Caribbean Court of Justice, Guyana’s final court of appeal. James said the Police Force’s administration would not treat lightly matters such as inaction, false imprisonment of person, and no entries.